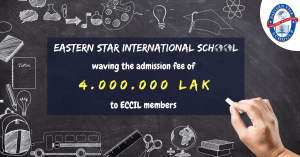 ECCIL would like to inform you that our member and Bronze Sponsor, Eastern Star International School, is waving the admission fee of 4,000,000 LAK to all ECCIL members. To get this benefit, you need to present ECCIL card when going to Eastern Star International School. Attached you can find the official letter from Eastern Star Schools. In case you would like to get more information about the benefit, feel free to call Eastern Star International School via 021261614-5 / 02029929941. We will keep updating our membership benefits, please stay tuned for the next ones!